The day after Obama’s State of the Union address my sister called me. “Was there anything in it for me?” she asked. from college 30 years ago. Healthcare reform? She’s already covered. Small business loans? She’s not a corporation. Mass transit funding? She commutes to work in her car. Cap-and-trade? That’ll probably cost her money in higher energy bills. Etc. A year into the Obama administration, America’s dominant geography, suburbia, is now in open revolt against an urban-centric regime that many perceive threatens their way of life, values, and economic future….For the first time in memory, the suburbs are under a conscious and sustained attack from Washington. Little that the administration has pushed — from the Wall Street bailouts to the proposed “cap and trade” policies — offers much to predominately middle-income oriented suburbanites and instead appears to have worked to alienate them. And then there are the policies that seem targeted against suburbs. In everything from land use and transportation to “green” energy policy, the Obama administration has been pushing an agenda that seeks to move Americans out of their preferred suburban locales and into the dense, transit-dependent locales they have eschewed for generations. Atrios says, “This is completely idiotic for mostly obvious reasons, including the hundreds of billions devoted to propping up single family home prices. 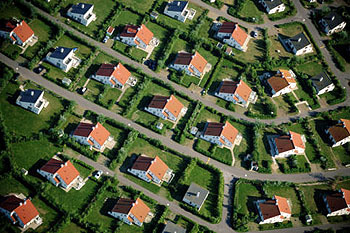 It isn’t necessarily a wise policy, but it’s hardly a war on the suburbs.” I agree: Kotkin is overwrought. And yet, Atrios bangs the drum pretty regularly for the notion that if Obama wants the public to support his policies, then the public better get some goodies out of it. And for the most part, suburbanites might well be feeling that they aren’t getting many goodies lately. “Hundreds of billions devoted to propping up single family home prices” is overwrought too, and in any case is generally invisible. The stimulus bill, for example, might have benefited my sister in some way, but there’s really no way to know. It’s just too diffuse. In other words, I wouldn’t dismiss this quite so breezily. Yes, Kotkin has an agenda. But there’s a real tension between good policy and good politics. Cost controls are good policy on the healthcare front, but lousy politics. Mandates are good policy but lousy politics. In the stimulus bill, metering out tax cuts a few dollars per paycheck was good policy but lousy politics. Likewise, promoting high density residential patterns might be good policy, but for suburbanites anyway, it’s lousy politics. You can ridicule it all you want, but suburbanites still have lots of votes, and they want some goodies too. That’s politics.